After one, busy, short month from the beginning of the rehab on Yorkshire, we finished all we set out to do and turned the keys over to the new owners. Many neighbors and the HOA stopped by to tell us the great job we were doing. They loved that we came in and fixed neighborhood eye sore. 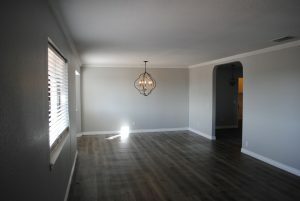 On the outside of this house, we painted the trim and garage, and added new lighting. 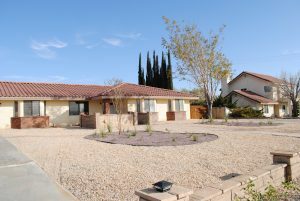 The biggest job and best use of money was adding landscape, several low maintenance plants, two crepe myrtle trees, and brought in California Gold Rock, with Desert Rose accent rock. The plants softened the look of the house, while the rock colors tied in the color of the stucco and the color of the masonry. 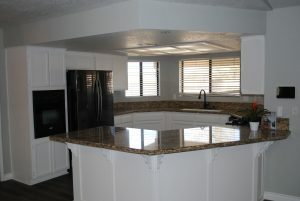 Inside, we painted the entire house a light gray and refinished the cabinets white for the new owner. 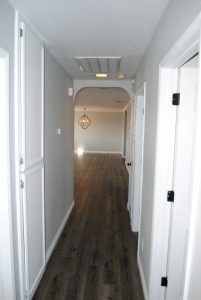 We laid new vinyl flooring through the house and carpeted the bedrooms. The living room was dark, so we added a brand new light and fan. 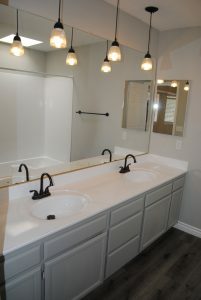 The bathrooms were updated by getting rid of the gold trim tracks for the glass sliders, and we removed the florescent light box adding drop lights. The house is all in gray and whites, but the designer did perfect by breaking up the monotony by adding the oiled bronze fixtures. 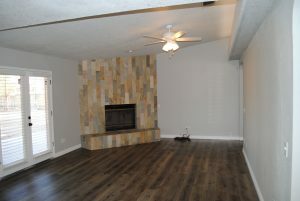 We really enjoyed this project and enjoy the couple that bought it. Hopefully they enjoy this house for many years. If you are a buyers agent and have families wanting to customize their dream home, contact us and we would be happy to help, (760) 813-6669.